(August 12, 2015, The Auk: Ornithological Advances)—A new mystery has been discovered in the migratory behavior of birds! Many songbirds travel long distances during their annual migrations, and it makes sense for them to do everything they can to conserve their energy during these journeys. Researchers have guessed that, for this reason, they might pick an altitude with favorable winds and stick with it rather than climbing and descending repeatedly, but there has been little data to back this up. In a study forthcoming in The Auk: Ornithological Advances presenting the first full-altitude flight data for migrating songbirds, Melissa Bowlin of the University of Michigan–Dearborn and her colleagues used radio transmitters to track the altitudes of migrating Swainson’s Thrushes (Catharus ustulatus) and were surprised to find that the thrushes actually made repeated altitude adjustments of more than 100 meters over the course of their nighttime migratory flights. The reasons for these altitude changes are not clear, but the researchers have a few theories. Funded in part by the National Geographic Society, Bowlin and her colleagues captured 9 Swainson’s Thrushes in a small forest fragment in Illinois during spring migration season in 2011-13, outfitted them with transmitters, and followed them with a radio-tracking vehicle to gather altitude data once they took off on a migratory flight. “I really thought that the birds would mostly behave like commercial aircraft, ascending to a particular altitude, leveling off and cruising near that altitude, and then coming down just before they landed,” explains Bowlin. “I was shocked when I made the first graph for the first bird, and thought it was an anomaly—maybe the transmitters weren’t working correctly! The more data we obtained, however, the more often we saw the up-and-down pattern to the birds’ flight. “I became interested in flight altitude because I tracked birds carrying heart rate transmitters as part of my graduate research,” says Bowlin. “One of the things you notice as you track birds is that sometimes, they seem to flying quite high—you can get a clear signal even when you’re driving through an area with tall trees. Other times, the signal is blocked by trees and buildings, meaning that the bird is flying low.” She speculates that the birds could be responding to the lights of cities or the rising thermals they create, adjusting to small localized changes in atmospheric conditions, or using some navigation strategy we don’t yet understand. In any case, something more is going on that simply minimizing energy use, and better understanding the altitude patterns of birds’ flights could eventually help us reduce threats such as collisions with skyscrapers and communications towers. 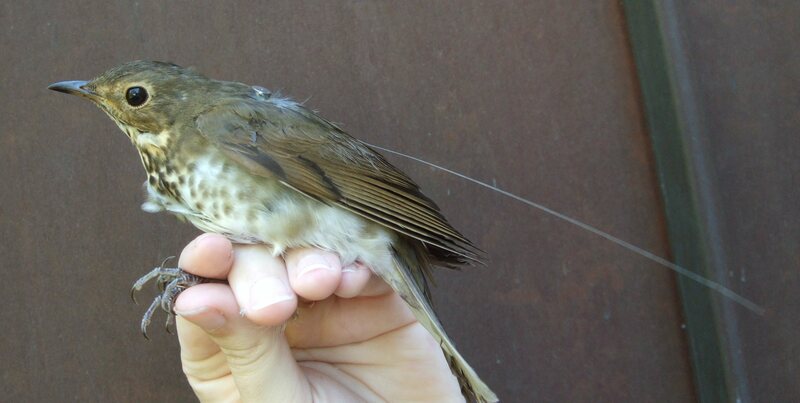 Unexplained altitude changes in a migrating thrush: Long-flight altitude data from radiotelemetry is available at http://www.aoucospubs.org/doi/full/10.1642/AUK-15-33.1. Contact: Melissa Bowlin, mbowlin@umich.edu.